Apple Red Sleigh Display is the perfect holiday fixture for your poinsettias and other arrangements. 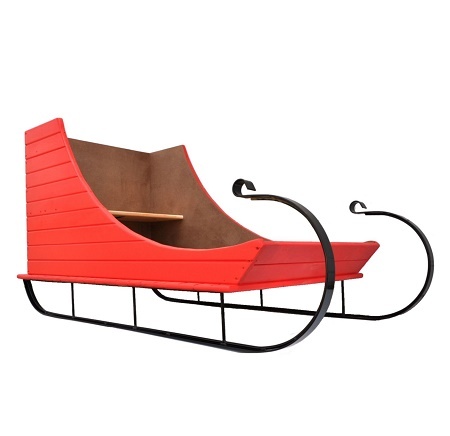 The Christmas Sleigh is one of our most unique products out of all the wooden display wagons. This wooden display is made out of sturdy pine wood. All the metal parts are powder coated black for durability to withstand most environmental elements outside or indoors. This display fixture is equipped with two parallel steel metal runners. Complete the look of your landscaping and decor, create your very own picture perfect photo opt display and order yours today! Overall: Length 64" - Width 35" - Height 35"
Inside Box: Length 49" - Width 30" - Height 27 1/2"
Shipping is approximate - We will call to verify shipping costs. Heavy Truck Shipped - Shipping Surcharge Applies.